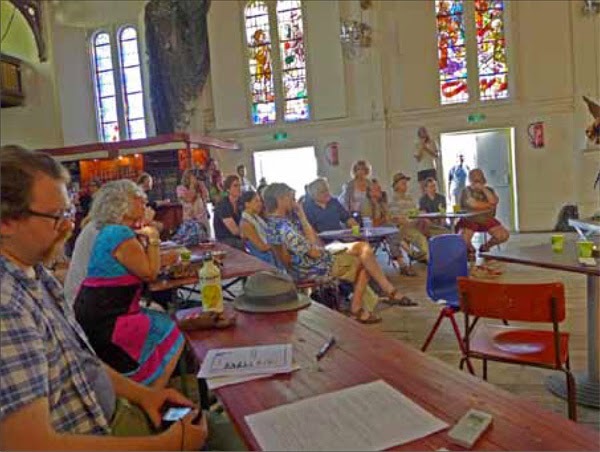 We hereby invite you to participate in the 5th Symposium, a Futurological Symposium, on Free Cultural Spaces (FCS), which this year takes place in Freetown Christiania, Denmark, on the 24th, 25th and 26th of September. The headquarter of the Symposium will be in our big beautiful Grey Hall with a circus tent in front. The Futurological Symposium on FCS is a platform for exchanging ideas and inspiring each other, but also for making plans to work together. 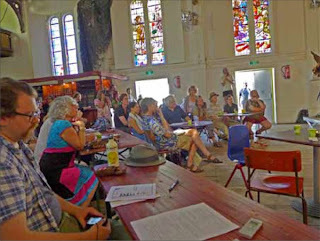 Last year the Symposium was held at the Boom Festival in Portugal and was a follow-up to three previous ones all held at Ruigoord, Holland, which took place during the summer Landjuweel Festivals in 2011, 2012, and 2013. At Boom we focused on The Importance of Festival Cultures, and this year our theme will focus on The Individual Versus the Collective (within FCS). Christiania is a permanent autonomous zone so big, that there is always a kind of festival atmosphere here. Christiania’s size facilitates both permanent autonomous zones and temporary ones. Christiania has the character of both structural types, and we celebrate her 44th birthday on Saturday the 26th of September – the last day of our Symposium! In 2011 Christiania celebrated her 40th anniversary. On that occasion Ruigoord established an embassy here; and in 2013 – when Ruigoord celebrated its 40th anniversary – Christiania established an embassy in Ruigoord. 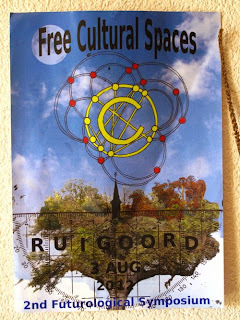 In 2013, at Ruigoord, the Futurological Symposium became a transnational conference embracing participants from many parts of the world. This conference was a central element of the celebration activities. One of the aims was to create a physical network that complements various ’virtual’ ones – a network promoting the collective interests of activists, artists, musicians, writers, performers, ecological farmers, native representatives and many more. Oral traditions – as when people join and interact – play a prominent functional role during the symposia, and with them come the exchange of ideas. In 2013, for example, a Declaration on the Universal Right to Free Cultural Spaces was debated. Our collective aim is to co-create a dynamic, lasting, sustainable, and non-hierarchical global network among FCS, and to further the exchange of ideas about the form and content of free cultural circuits and independent cultures. We all participate to create a transnational free circuit between permanent, temporary, virtual, and nomadic free spaces. We promote exchanges between north and south, west and east; Europe, Africa, Asia, Australia, and America; farmers, architects, musicians, poets, actors, artists, painters, clowns. . . whoever, whatever, and wherever you are. . . We stand for durability, ecological approaches, and social experimentation. When you call yourself a ’free society’, you appear to set yourself up in opposition to an ’unfree’ society. But we don’t have to be against something to stand for something else. Autonomy, although derived from anarchism, is not the same as anarchism. Anarchism opposes repressive political systems, autonomous groups do what they think best. We see FCS as autonomous, and believe we are the ancestors of our future mini-societies. By working on our mini-societies, we give value to the society at large. Despite the stresses of the process of institutionalization, it can bring about cooperation. If, for example, Christiania and ThyLejren (Denmark), Fusion (which, like Boom, is a festival that is slowly turning into a permanent autonomous zone) and UFA-Fabrik (Germany), Doel (Belgium), Ruigoord (Holland), Umbrella House and Autonomedia (USA), Projecto Nuevo Mundo (Mexico), Eco Center IPEC (Brazil), and Boom (Portugal) all join forces, stronger statements can be made about aspects of freedom, ecology, and culture in general. The symposia bring us together in order to meet, to plan and to realize. We collaborate without becoming a corporation, board, foundation or any other kind of umbrella or centralized organization. There’s no hierarchy, no central office, and there are no functional roles ¬¬– but there are fixed relations. It’s a handshake, and always the activity of the people themselves. Every society needs oxygen to exist in harmony. Enclaves of freedom exist for people of all ages and all cultures and have existed throughout historical time. In the language of the global business elites, every corporation with respect for itself has a laboratory for research and development. Let the Futurological Symposium on FCS be to the communities and countries involved what a developmental research laboratory is for a global business corporation. Above everything we value HOMO LUDENS – the playful human being! So show your face. Let’s meet and work together ¬– hopefully with some new participants! When we know each other better, we can formulate joint projects. First of all we invite one or two representatives from the different groups, who have previously participated – but also interested newcomers – to make a short speech and a power point presentation about their Free Cultural Space. In our big Grey Hall it will be possible to hang things on the walls ¬– after consultation. So we would ask you to bring an object with you that represents your own FCS. If you want to have a booth or a table for your FCS material, please let us know. There will be inexpensive food and beverages for everyone. We will try to do our best to find places for you to stay during the Symposium – but IF you can find arrangements yourself, that would be helpful. Christiania unfortunately doesn’t have a hostel yet, so we are searching for accommodations with private families and elsewhere. On the other hand – for our specially invited guests – who will make longer speeches and are paticipating in organizing and running the Symposium – there will be food and drink tickets, as well as accommodation possibilities. Concerning traveling costs we will ask you, if it’s possible to find your own funding – for example through your own FCS/association – or in some other way. The development of the program is still in process. At the moment we are mostly choosing the main speakers. Write to us quickly, and let us know if you are interested at all – and IF YOU ARE – how many of you expect to come, and when you want to arrive. When we know how many are coming, you will receive more detailed information.